Gibraltar is an overseas British territory located in the south of Spain at only approx 1 hour and 40 minutes' drive from Malaga Airport. The official language is English, used by their government and schools, but most locals are bilingual (Spanish-English). The currencies are the Gibraltar Pound (£) and Pound Sterling, which are interchangeable. You can spend Euros in most places (except post offices etc) but at poor conversion rates. Malagaairport-transfers.com is pleased to offer personalised excursions and tours to Gibraltar in private luxury taxis with English speaking drivers. Gibraltar shopping is well-known, with duty free goods and products like tobacco, alcohol and chocolate usually a lot cheaper than in the rest of Europe. In Main Street, Gibraltar's main shopping area (which extends nearly the entire length of Gibraltar), most shops have their windows packed with goods of all kinds at attractive prices; you will also find most common English shops such as Benetton, Marks & Spencer, BHS, Mothercare, Evans and Dorothy Perkins, amongst others. 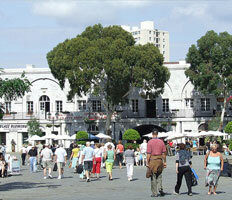 La Piazza and Casemates Square are two points of interest highly recommended to see while you are visiting Gibraltar. One of the most popular things to do in Gibraltar is to take the cable car which runs to the top of The Rock. The route includes a stop-off at the Apes' Den (a place where you will always see Barbary Apes), while inside The Rock you will discover amazing tunnels and caves. The breath-taking views from the viewpoint at the top include the coast of Africa. Like the sound of Gibraltar and planning a holiday or trip? 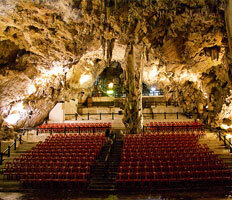 Find out the great prices we can offer you on cheap airport transfers to Gibraltar. It’s simply the most convenient way to get around.